With the car stripped of primer, cleaned of glass, and ready for bodywork, Dad and I took some time off to work on another important task, something that would have to be finished before we could continue any further: teaching me to weld. Dad figured that as long as I needed some metal to practice on, I should make something useful in the process, so he drove down to Maxx Metals in San Carlos and picked up a few angle irons with which we built a stand for our bench vise. He has a nice Hobart MIG welding unit that was just right for our purposes. After making me watch a short instructional video and giving me some basic pointers, Dad let me start practicing on some scrap before we started assembling the stand. Dad came up with a design for a square base with 16 in. sides and a platform with 8 inch sides connected by 4 angle irons of 30 inches. 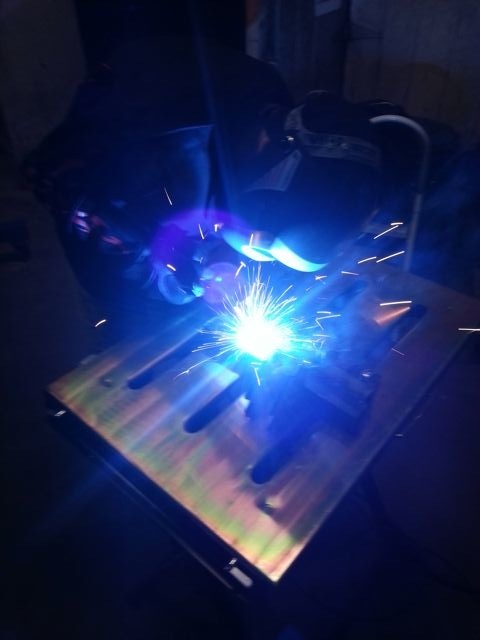 Some quick trigonometry showed that the 30 inch pieces would have to be angled in at 79.1311°, so we rounded up to 80 and pulled out the plasma cutter, which proved extremely useful for cutting our 6 gauge steel. With the legs cut to the correct angle, we used a grinding wheel to clean up the metal before welding, threw on a few tack welds to hold the structure in place, and finished welding together the stand. With that project completed, we moved back to the Mustang. With only two spots of serious rust on the car, we decided to start by replacing those. We pulled the plasma cutter back out and excavated the battery tray, which looked like Swiss cheese. We may decide to place the battery in the trunk later on, but the corrosion would have to be removed regardless. I smoothed out and cleaned up the edges with a grinding wheel while Dad used some posterboard to make a stencil for cutting new sheet metal. Dad trimmed and bent the metal until the fit was good, pulling out the body hammer to really lay down the edges for a close fit. We pulled out the welder, and I started by laying a few tack welds to keep it in place. However, I had never welded anything thiner than 3/16 inch, and when I went to lay down a bead, I blew through the metal pretty quickly. Dad did the best he could to patch up what I had done, and then I went back to placing tacks to avoid making the matter worse. Sometime soon I’ll grind down the welds and see which ones need replacing or reinforcing. Hopefully it’s not too ugly. 48 mySQL queries in 0.176 seconds.